The Culver Studio Events – RSVP here for upcoming activities. 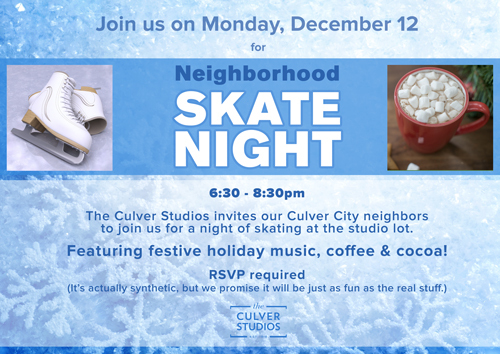 The Culver Studios invites our Culver City neighbors to join us for a night of skating at the studio lot. The event will feature delicious hot coffee and cocoa, while skating on an artificial “ice” surface. Skating begins at 6:30pm; please RSVP below and indicate what time you plan to attend. Guests will enter the studio lot through Gate 1, which faces Washington Blvd. in front of the Mansion. To RSVP, fill in the form below with names of ALL guests, including children. Thank you! Please note: On-site parking will only be provided for our neighbors with limited mobility. Please contact the Studio at security_parking@theculverstudios.com or call 310-202-3347 to arrange parking. We encourage our neighbors to walk. © 2019 The Culver Studio Events. All Rights Reserved.